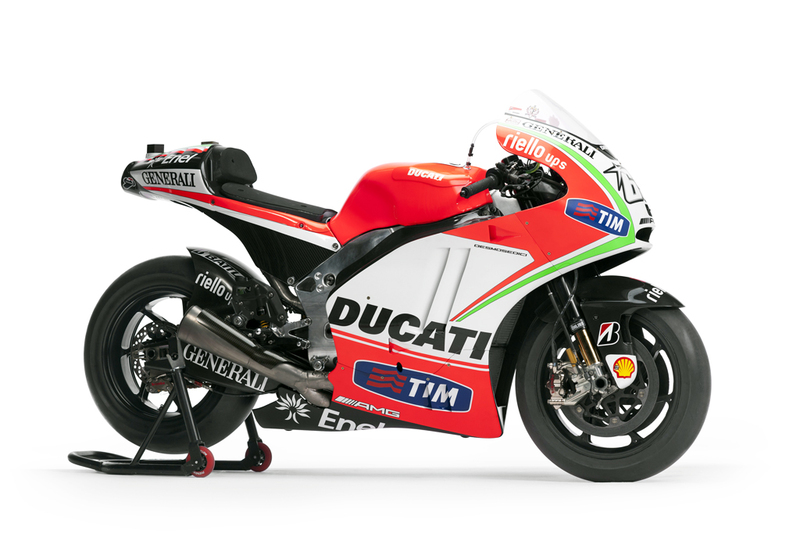 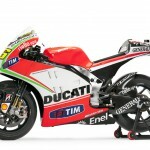 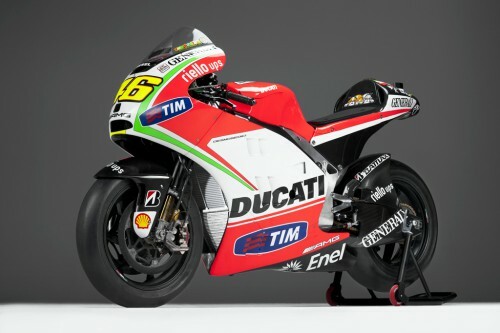 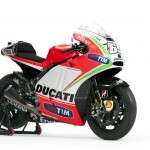 Ducati unveiled its Desmosedici GP12 race bikes in on online presentation streamed over Facebook. 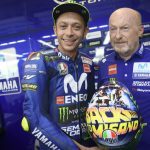 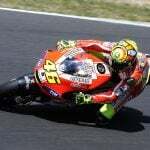 With the machine officially revealed, the pressure now turns to factory riders Valentino Rossi and Nicky Hayden who try to rebound in the 2012 MotoGP World Championship after a difficult 2011 season. 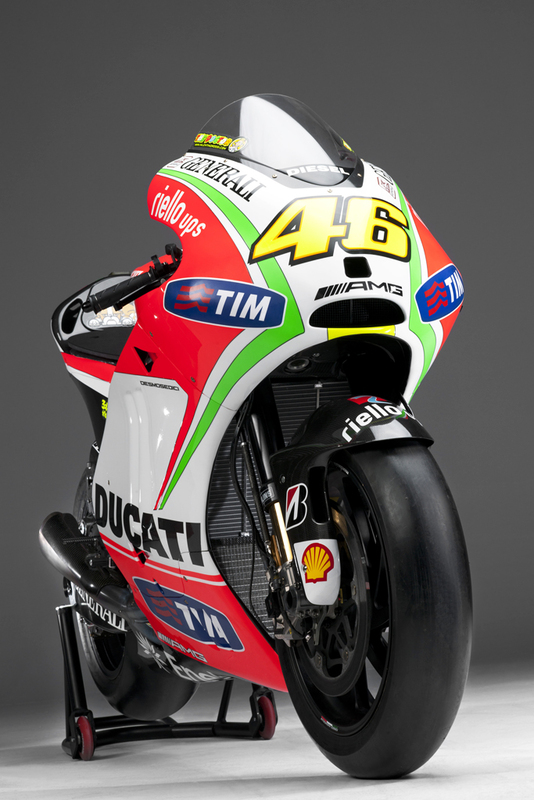 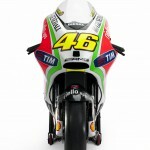 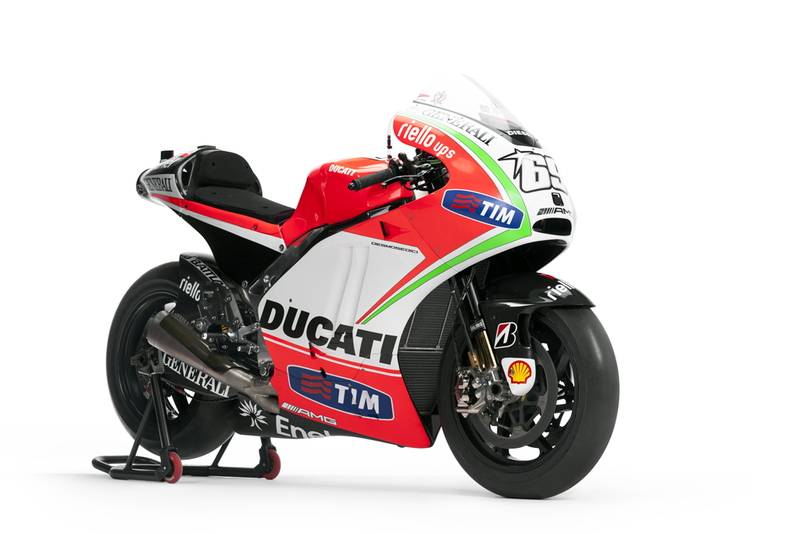 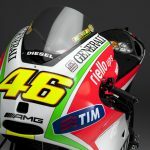 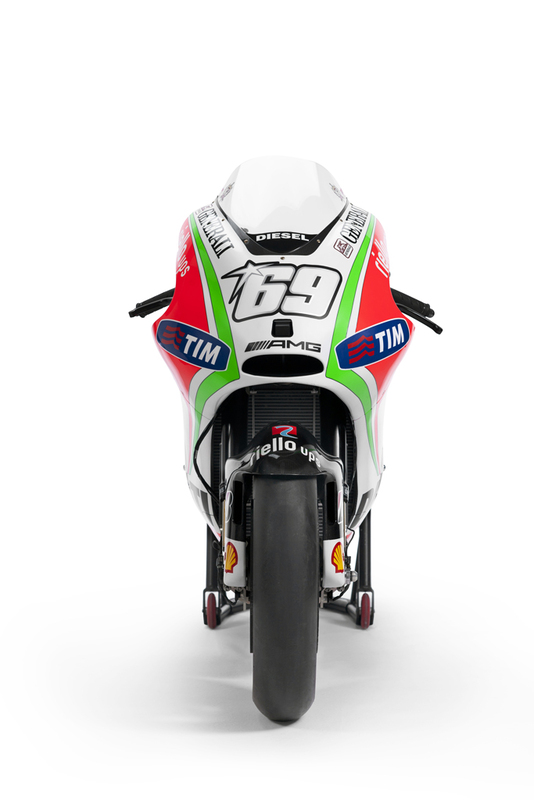 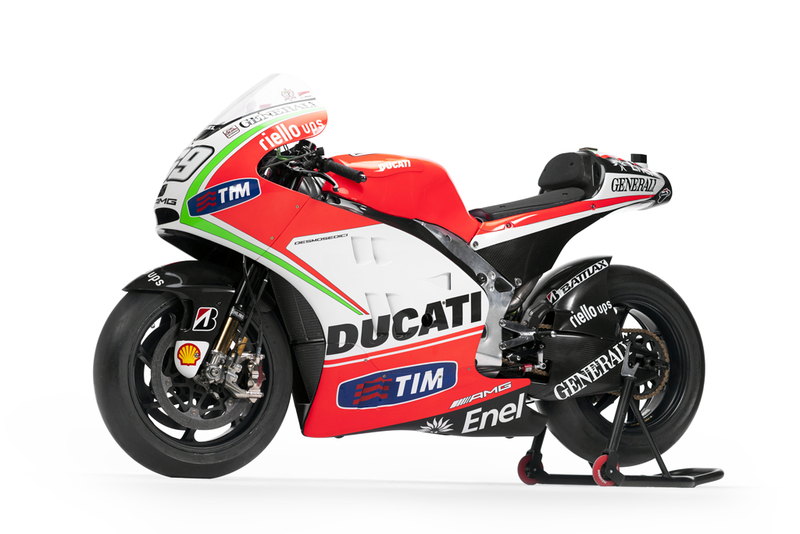 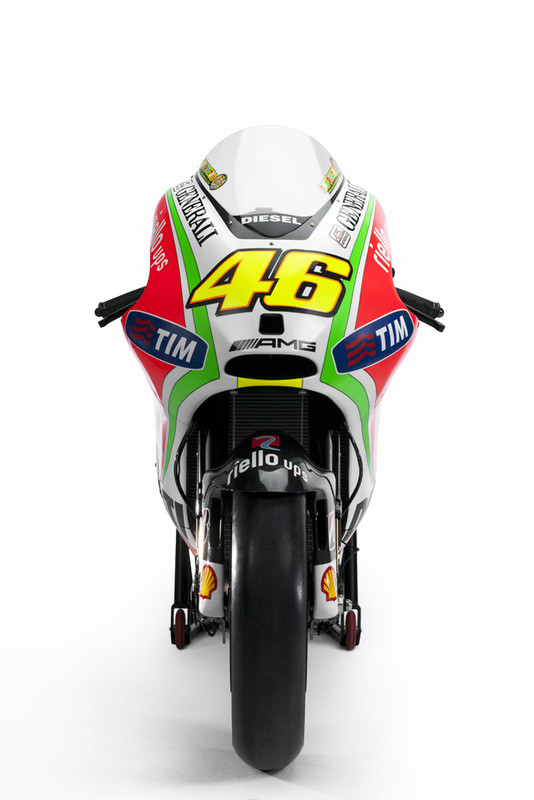 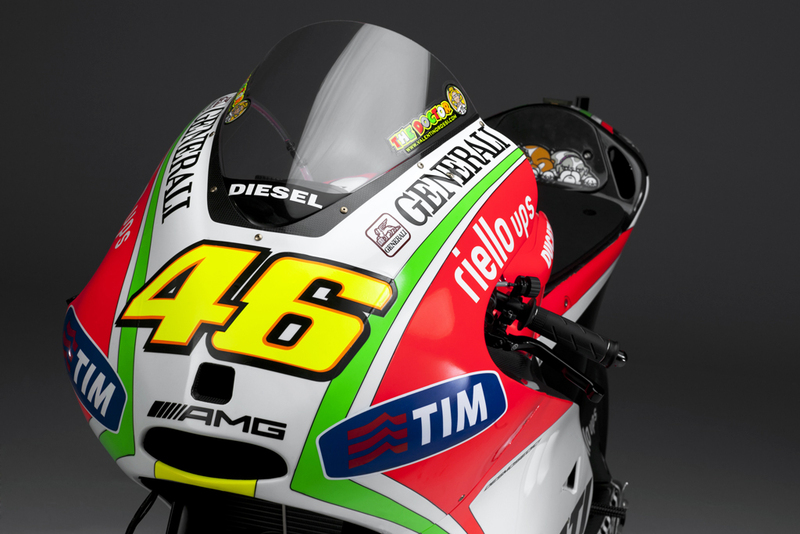 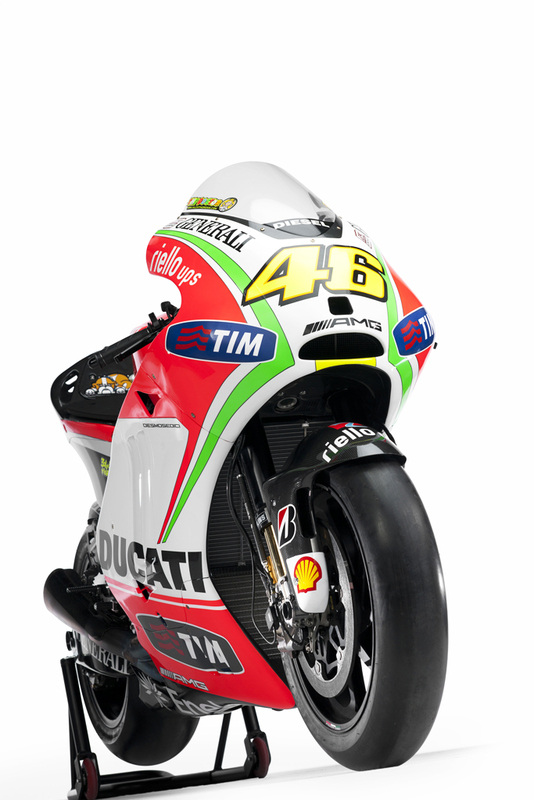 The 2012 livery adds a touch of green striping resembling the tricolore version of the Ducati 1199 Panigale S and celebrating the company’s Italian heritage. 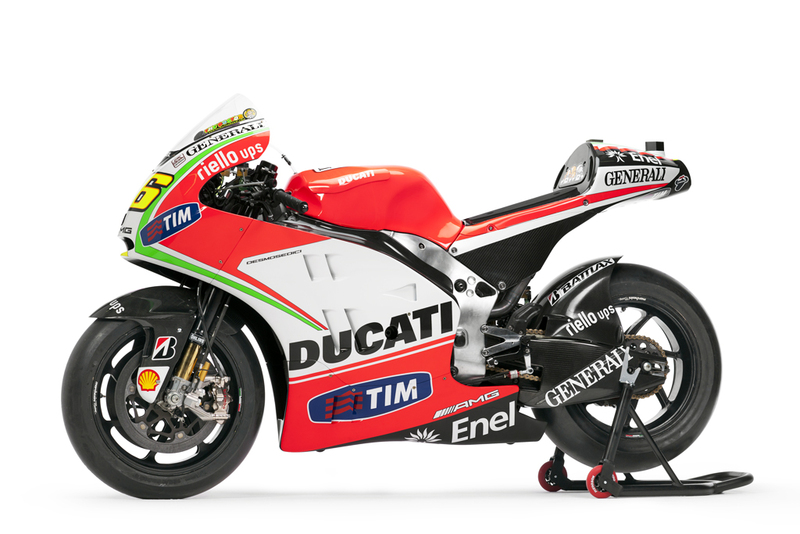 Unlike the Panigale and its monocoque frame, the Desmosedici GP12 uses a more traditional aluminum twin spar frame. 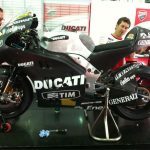 According to Ducati’s spec sheets, the Desmosedici is powered by a 1000cc 90-degreee V4 engine with four desmodromic valves per cylinder. 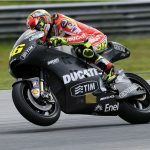 Ducati claims a power output exceeding 230hp while top speed is over 205 mph (Ducati won’t tip off its competitors by being more precise with those figures). 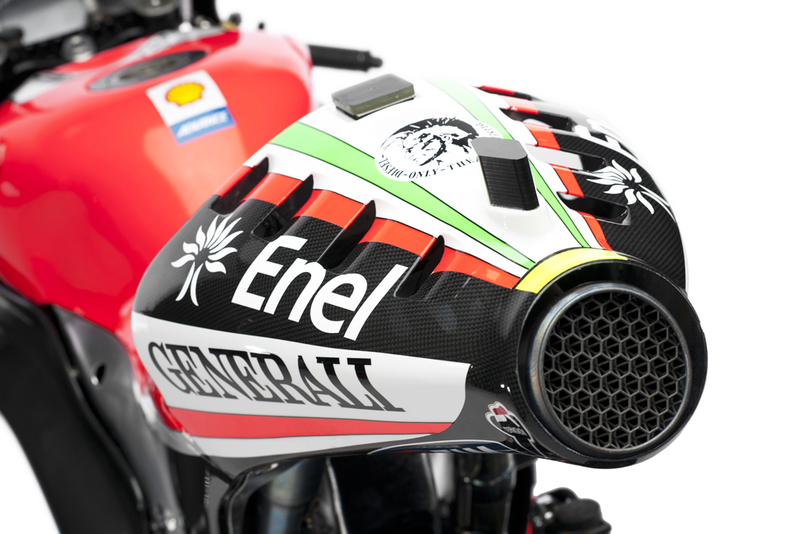 In comparison, the GP11 and its 799cc engine claimed an output of over 200 hp and speeds over 192 mph. 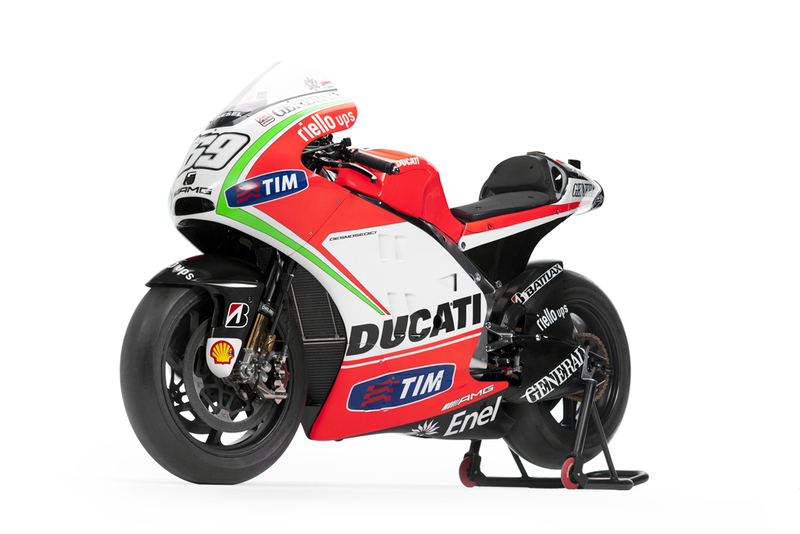 Power is transferred to the rear wheel through a seamless transmission system offering quick gear changes without disrupting power. 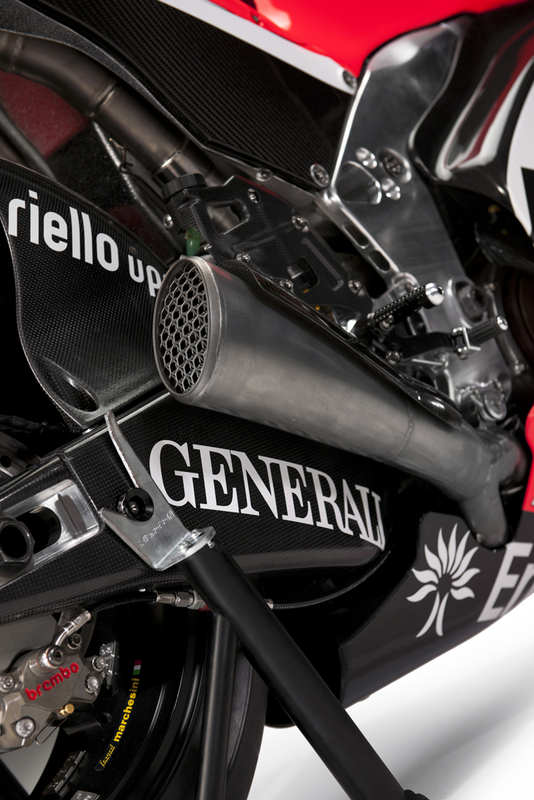 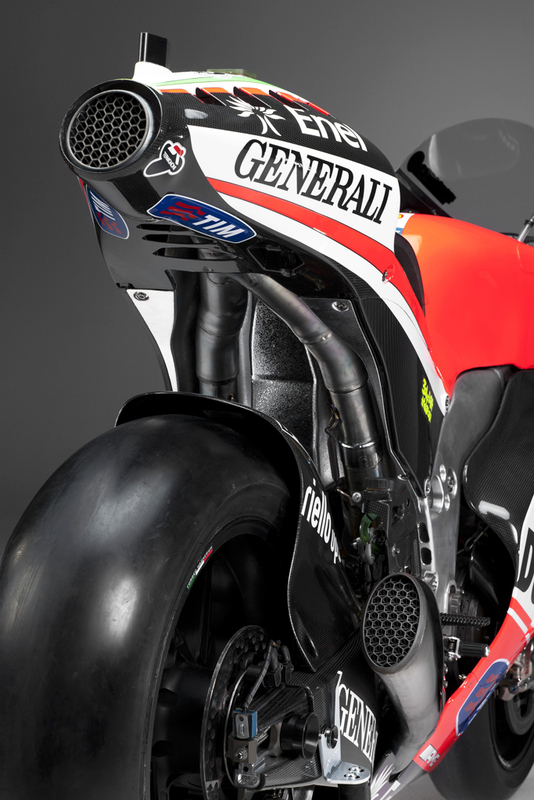 The GP12 is also equipped with a Termignoni exhaust, 48mm upside-down Ohlins fork, and Ohlins rear shock. 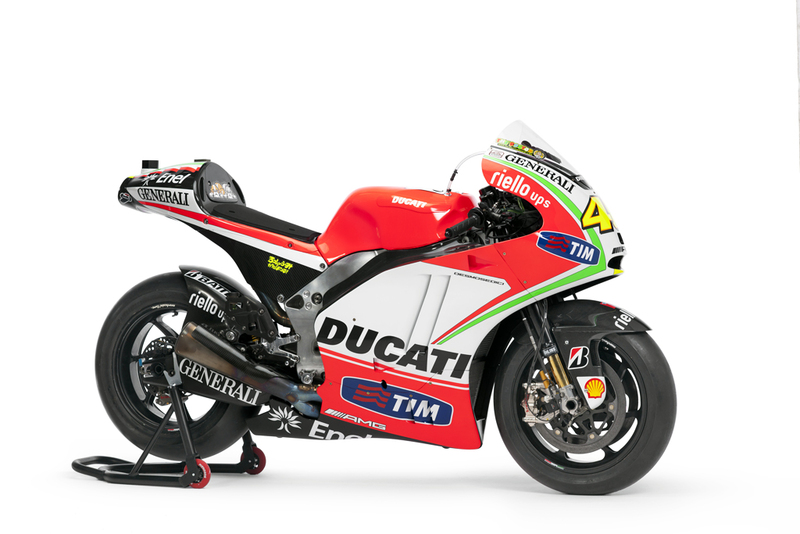 Brembo supplies the twin 320mm carbon front discs and four-piston callipers as well as the single steel rear disc and two-piston calliper. 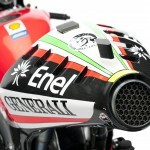 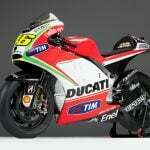 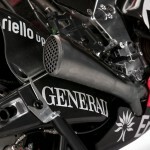 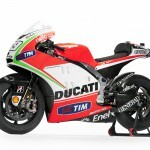 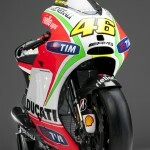 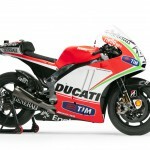 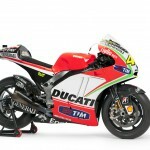 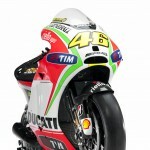 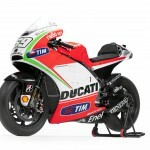 Ducati claims a dry weight of 346 pounds, up from the GP11’s 331 dry weight.